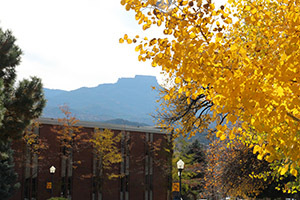 The Trinidad Campus offers a true college experience in a beautiful and friendly setting on the eastern edge of the Colorado Rockies. The historic 17-acre campus sits at 6,000 feet and is adjacent to mountains on the north, south and west and canyons and rolling prairie on the east. The campus has four residence halls, a cafeteria, library and modern classrooms. We also have an archaeology museum on campus which includes many area fossils. The Diesel Technology and Heavy Equipment programs operate training sites at off campus locations. The college also operates a shooting range a few miles out of town as well as an indoor shooting range for air guns to support the storied gunsmithing program. Click here to schedule a campus visit or call 800-621-TSJC.